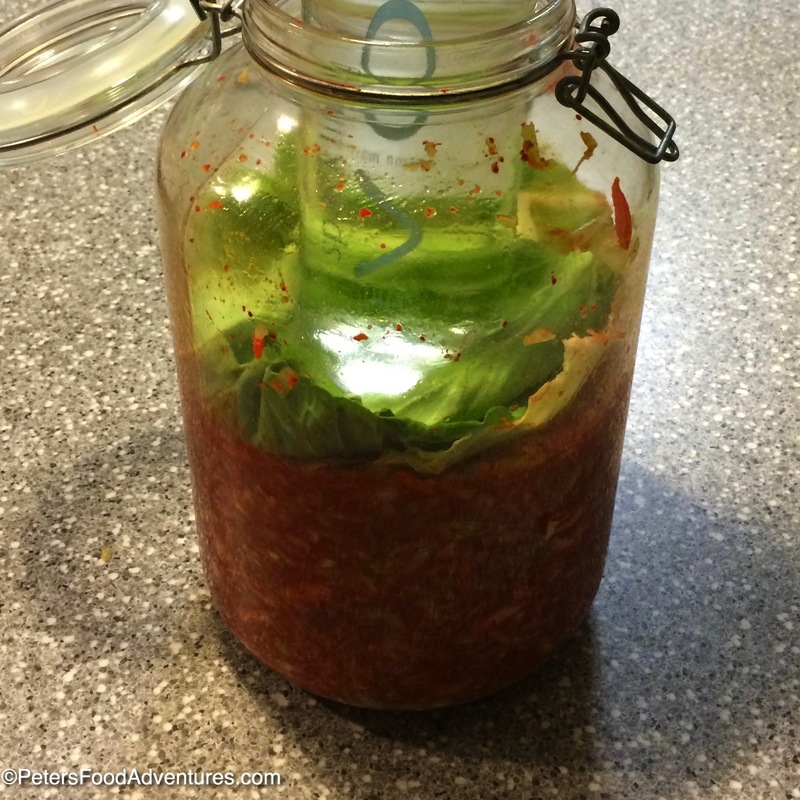 Fermented Spicy Sauerkraut is so incredibly healthy to eat, and not a new trendy idea. Many cultures around the world have a way of preserving and fermenting cabbage. Historically this provided food to get through the winter. Eastern Europe and Germany have Sauerkraut, Korea has Kimchi, and Central America has Curtido. Sauerkraut is made by a process called Lacto-Fermentation. When the cabbage is submerged in a salty brine, it converts the sugars into lactic acid. This is a natural preservative, which preserves your food. And did I mention the health benefits? Fermented Spicy Sauerkraut has many of the same probiotics, digestive enzymes and live cultures that are found in yogurt. It’s like a Superfood! This doesn’t include many store-bought Sauerkrauts that are typically pasteurised and soaked in vinegar. If you’re buying fermented sauerkraut, look for them in the refrigerators. Be warned, they tend to be pretty expensive. I love spicy food, so it seemed like a no brainer to experiment and make a fermented spicy sauerkraut. If you’re unsure of how spicy you want it, start with 1 tablespoon of Gochugaru flakes (spicy chili) and taste to decide how spicy you like it. My previous recipe for kimchi found here, has an amazing Asian flavour which gives my food a spicy Asian twist. Is Spicy Sauerkraut same as Kimchi? 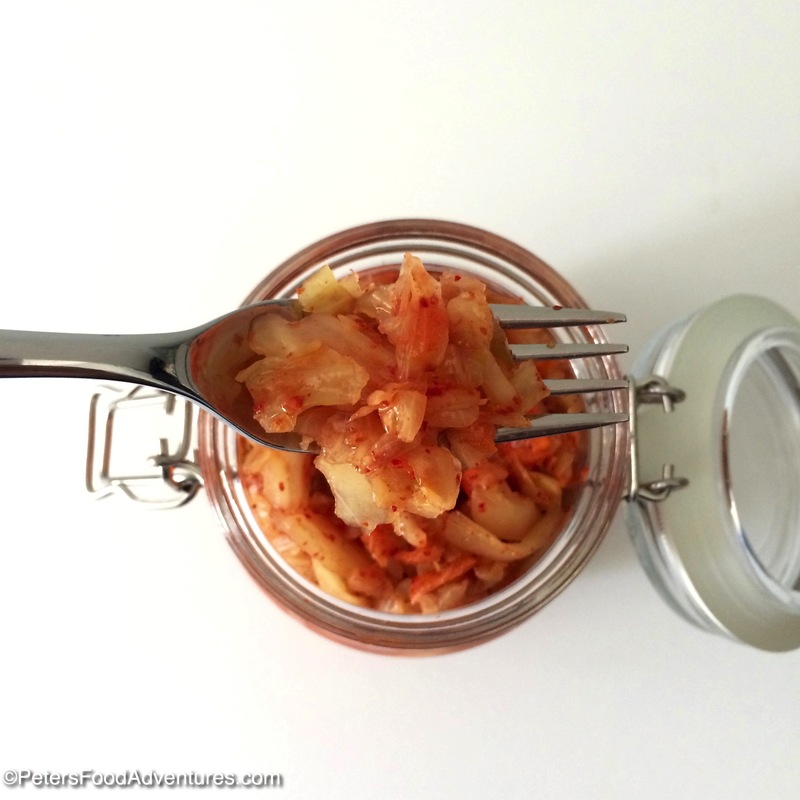 Compared to kimchi, this recipe for Spicy Sauerkraut adds a different element of spiciness to my meals. Although using the same Korean chilli flakes found in kimchi, but this tastes nothing like kimchi, it’s a sauerkraut. You could simplify it even further by just using cabbage, salt and the spicy chilli flakes, but I like to add carrots with a bit of onion and garlic. You really only need 1 carrot, but I used 2 because I like the sweetness carrots add, but you can completely skip these. My favorite way of eating Spicy Sauerkraut is adding it to hot dogs or burgers. So good! You can also eat it as a side dish for its amazing health benefits. 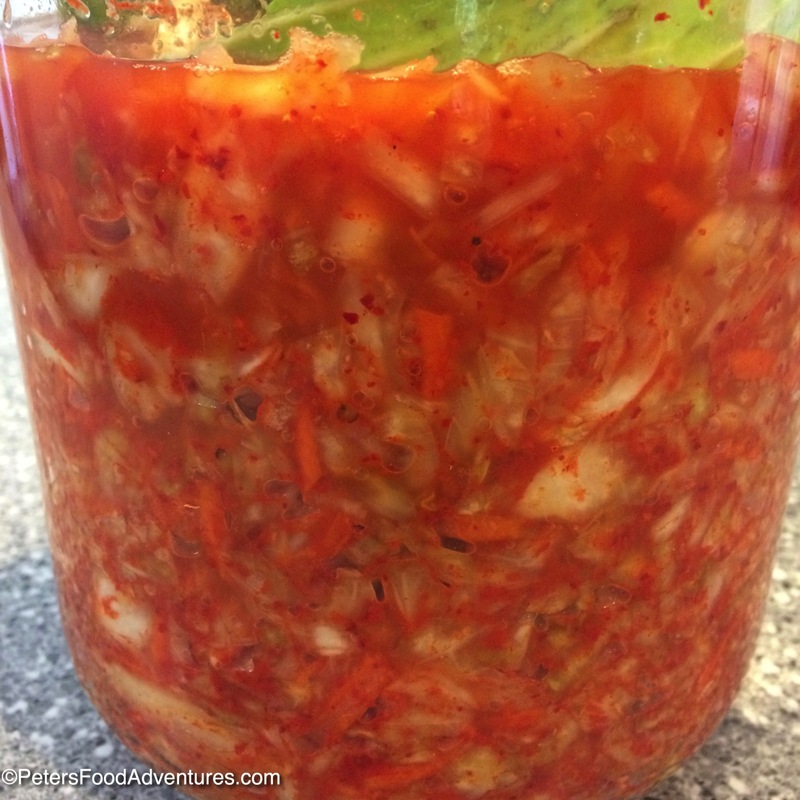 If you’re interested in healthy fermented foods, and have always been interested in making your own Sauerkraut or Kimchi give these recipes a try, you won’t regret them! Bon Appetit! Приятного аппетита! Remove the outer leaves of the cabbage, set 1 leaf aside and discard the rest. 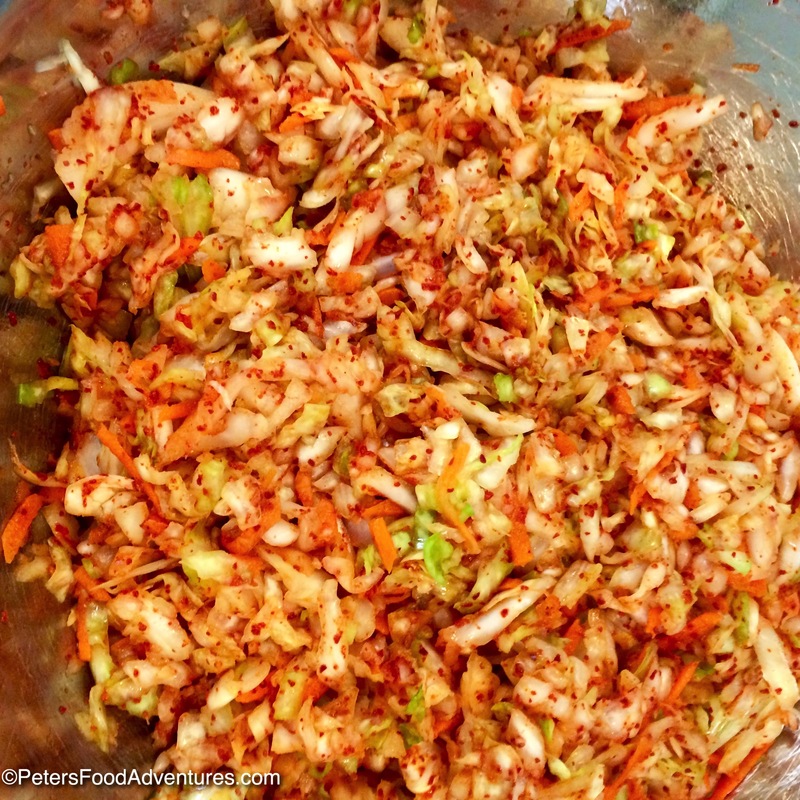 Cut the cabbage into quarters, remove the core, and shred thinly, like you are making coleslaw. Don't worry about the length of cabbage, it will break down further in the next step. Place all the ingredients in a large bowl, put on some gloves and start to massage the cabbage mixture for about 5 minutes with your hands until it starts to release its liquids. Ensure the salt, garlic, onions and chilli flakes and completely mixed throughout. If your cabbage doesn't fit into the bowl, massage it with salt first before adding other ingredients, it will reduce significantly as the water is released from the cabbage. Place a plate large enough to cover the cabbage mixture, over the cabbage. Put something heavy on it, like a jar filled with water over the cabbage mixture. This will add pressure to the cabbage to keep releasing the juices and keep it submerged in the brine. Allow to rest for about 1-2 hours to continue the process of juices releasing. Pack the cabbage mixture into a sterilised container (I'm using a glass jar). Pour any leftover brine into the jar. 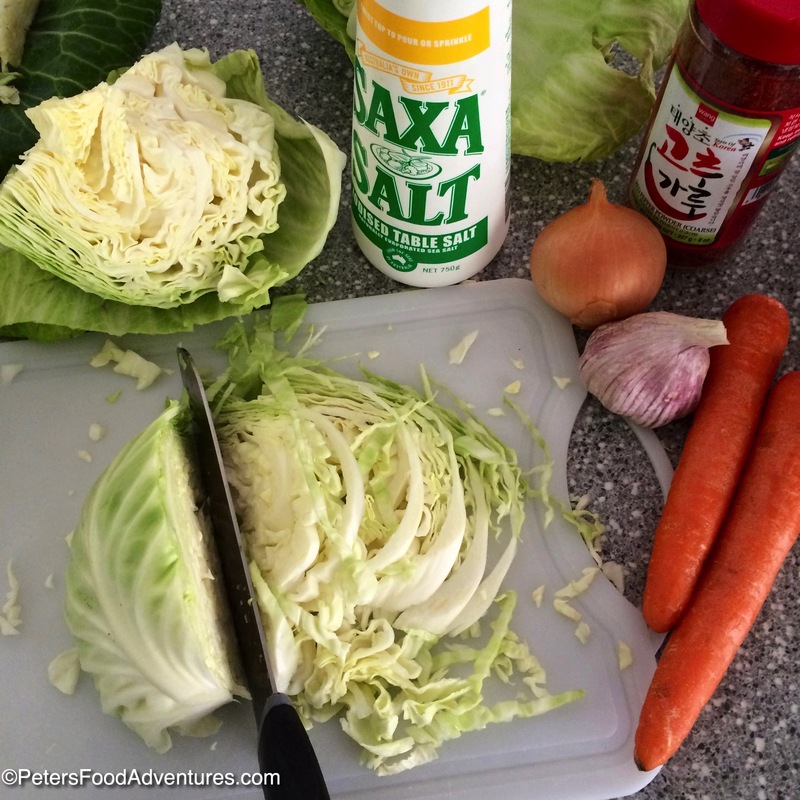 Using the leftover cabbage leaf that you set aside, cut it to fit on top of the kraut in the jar. 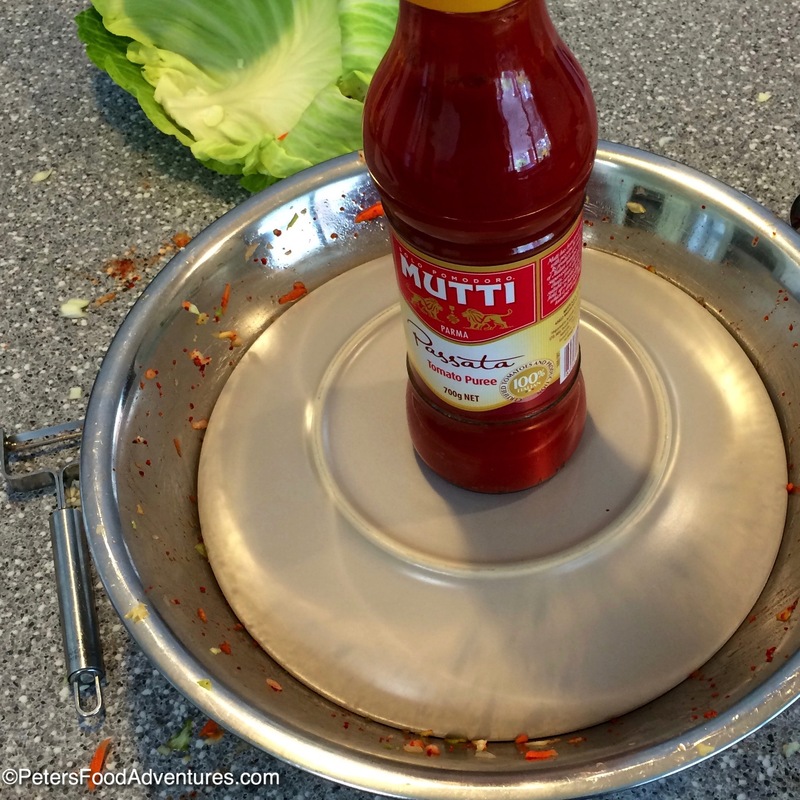 Using a glass jar or soft drink bottle filled with water, place on top of the cabbage leaf to keep pressure on the kraut and keep it submerged in the brine. Cover with a tea towel and an elastic band, allowing air to flow but keeping dust and undesirables out. After 24 hours, if there isn't enough brine liquid generated in the kraut, you can add 1 cup of water with 1 teaspoon of salt dissolved in it to boost the water level, to the same level as the top of the kraut. The fresher the cabbage, the more liquid is released. Allow the cabbage to ferment for at least 3-4 days at room temperature. Taste. If you like the taste more sour, continue fermenting until you are happy with the taste. I don't usually go longer than 1 week, but it's up to you. Remove towel and bottle, close the jar with a lid and keep refrigerated. If you see any mould, skim it our immediately, if any kraut is mouldy, remove it immediately, but the rest of the Sauerkraut is fine. Keep the Sauerkraut refrigerated. It should last for 2 months but often will last longer. Just check that it smells ok and there is not mould and tastes fine, and you should be fine. Trust your stomach, if it doesn't feel right, then don't eat it. Wow this sounds great! I love Sauerkraut! Looks a little like Chinese or Korean style, but I know this is your original. Yeah, it’s the chilli flakes. You can use other chilli flakes that aren’t Korean, but I find they aren’t as spicy. It definitely tastes like sauerkraut, with a bite! ???? Thanks! I love the spiciness! The health benefits are ok too! ???? I love spicy foods and sauerkraut. This looks amazing! I have to try this! I always buy kimchi but was always a little afraid to make my own because I thought it might be difficult. Great! Well here are the 2 different types of fermented cabbage. I’m not sure which one I like better! ???? Yum! Can you use a plastic container for this? Hi Sarah. I believe the reason glass is used is because it can be sterilized, which is incredibly important when fermenting. (So the bad bacteria doesn’t grow as well). ???? Wow, this looks really good! I’m interested to try it and see how it compares to kimchi. I love sauerkraut (Bubbies is the best I’ve tried) so I should definitely try making some myself! Thanks Rhianon! It’s nice if you like spicy ??? ?